I hope all of my sweetheart friends are having a lovely day today! Did you receive a treat from someone you loved today? Have you treated yourself? Well…for goodness sakes, why not? 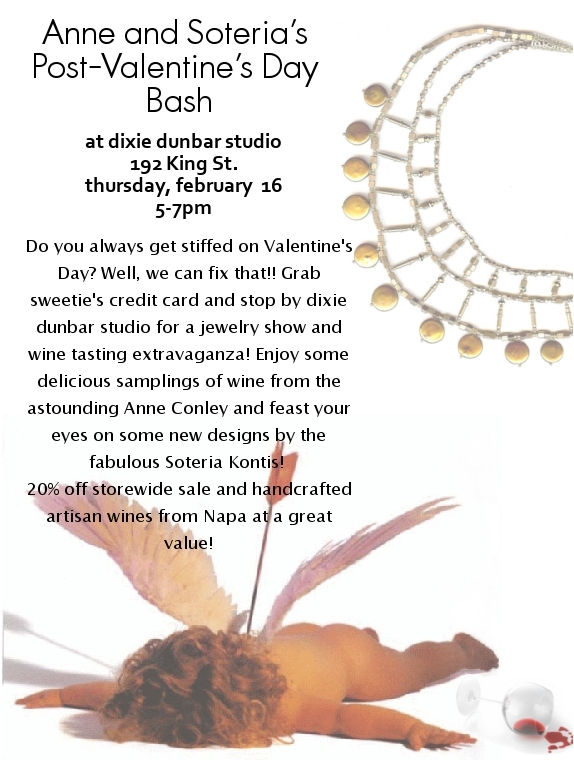 Stop over at Dixie Dunbar Studio right now and get yourself something special. For one week only the rest of the month (thank you, Soteria! ), use coupon code XOXO to receive 20% off your purchase! And if you happen to be in Charleston, SC this week, do stop by 192 King Street on Thursday night for a glass of wine to celebrate Soteria and Anne’s post-Valentine’s Day bash!